Susan Anderson-Kimm paints luminous abstract paintings that consist of multiple subtle layers of spiritual messages written directly into the canvas. On one level, the paintings suggest landscapes, focusing on the universality of the horizon line. On another level, the work reveals sacred spaces that swell beyond our everyday reality. She lives and works in Minneapolis, Minnesota. Taubman Lobby, North, Floor 1. Open daily from 8 a.m.-8 p.m.
Glenn Wolff’s paintings and drawings are often done on found objects such as yardsticks, ladders, doors, and tin, but he also works on canvas and paper. His works are meditations on interior and exterior landscapes, different kinds of creatures, and sky, often twilight – that state of imperfect clarity that exists between daylight and darkness. John Berger, the art critic, novelist, painter and author wrote, "Art is an organized response to what nature allows us to glimpse occasionally." These works are responses to those moments, when at twilight, in a river, one can see the whole universe on the back of a brook trout. Taubman Lobby, North display cases, Floor 1. Open daily from 8 a.m.-8 p.m. This show celebrates the emerging artistry of students from Saline Public Schools. 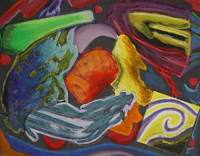 Work from young people in grades K-12 discovering and developing their artistic approach and technique will be displayed in both 2-D and 3-D galleries. All variety of mediums from drawing and painting to ceramics and sculpture, exploring different themes as presented by nine different teachers from twelve grades, are included in this exhibit. Taubman Lobby, South, Floor 1. Open daily from 8 a.m.-8 p.m. This exhibit of all new work features large scale portraits of U-M Football stars, from those on the field to those on the sidelines, from greats that have moved on, to those that remain. 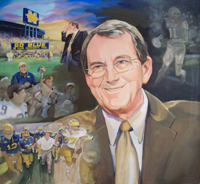 We’ll see a portrait of a former U-M player who demonstrated his excellence, if not perfection, in the Super Bowl this year, as well as a seven foot painting of the award-winning recently retired coach, Lloyd Carr. Susie McColgan’s dynamic and penetrating paintings portray individuals in large scale with depth, feeling and technical mastery. This Michigan alumna from the School of Art & Design comes from a long line of Michigan alums, continuing with her son, who played football this year under Coach Carr. In addition to those mentioned, this exhibit premieres portraits of Mike Hart, Jake Long, Chad Henne, Desmond Howard and Charles Woodson. University Hospital Main Lobby, Floor 1. Open daily from 8 a.m.-8 p.m. Incorporating vintage and unusual found items, Sarah Stanton and Jay Kukor’s jewelry has been described as funky, industrial, modern and fun. The jewelry combines a unique blend of antique texture with urban, architectural elements. Typewriter keys, antique buttons, vintage wooden rulers and skeleton keys combine with sterling silver to create one-of-a-kind jewelry with an eclectic flair. Stanton is inspired by unusual materials, textures and patterns, and Jay brings clean lines and a modern aesthetic to the designs. They have been making jewelry together for more than twelve years. University Hospital Main Lobby display cases, Floor 1. Open daily from 8 a.m.-8 p.m. The healing power of art is a driving force in all of Tamara Sprague’s work. Two distinct artistic styles are represented in this exhibit: one is stylized ink and colored pencil drawings, while the other is multilayered fabric compositions. Even though the two styles may appear quite different, both are inspired by Sprague’s deep relationship with nature. Her work is both playful and thought provoking. Tamara resides on the scenic Oregon coast with her husband and has exhibited her work in the Coos Art Museum in Oregon. University Hospital Main Corridor, West, Floor 2. Open daily from 8 a.m.-8 p.m.
Cancer Center Main Lobby display cases, Floor B2. Open Monday-Friday from 8 a.m.-5 p.m. Originally engaged in looking inward, this group of photographers intimately and explicitly explore and document their lives as cancer survivors. The group grew out of the project Still Life, funded by a grant from the Lance Armstrong Foundation and facilitated by the Creative Center in New York City, which produced a group show and a book. 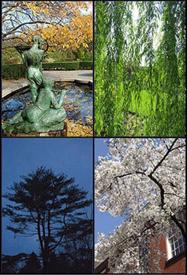 Shifting their focus from the intrapersonal terrain, for this exhibit, the group focuses outwards to the archetypal cycle of all life, the four seasons. Documenting moments expressing the essential spirit of each of the four seasons, these images invite participation in celebration of the cycle of life. Comprehensive Cancer Center, Level 1. Open Monday-Friday from 8 a.m.-5 p.m.